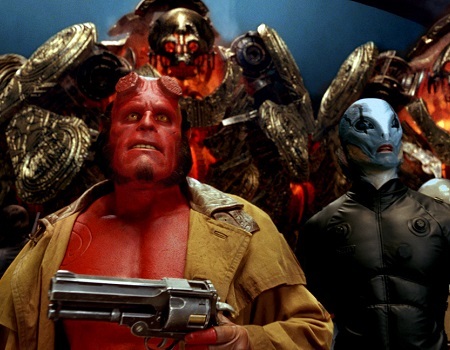 Among the offerings in del Toro's body of work, it's Hellboy 2 that best shows off his gift for design and the limitlessness of his imagination. One scene in the film perfectly encapsulates both of these qualities: the infamous Troll Market sequence. In a movie peppered with awesome design work, it's the BPRD's jaunt through this crowded bazaar of the bizarre that takes the crown. In fact, there's so much neat stuff on display here that watching it once simply isn't enough. From the moment Hellboy and the BPRD enter the Troll Market, del Toro stuffs the frame with all kinds of oddities, curiosities, grotesqueries, and gonzo beauty; your eyes will dart this way and that, trying to capture the visual feast in its entirety. Fortunately, DVD players have rewind buttons, so monster connoisseurs can watch the scene over and over to their hearts' content.